Get your spook on this Halloween with our fun decorating ideas. As you prepare your costume and stock up on candy, we’d like to share some terrific Halloween decor items with you. 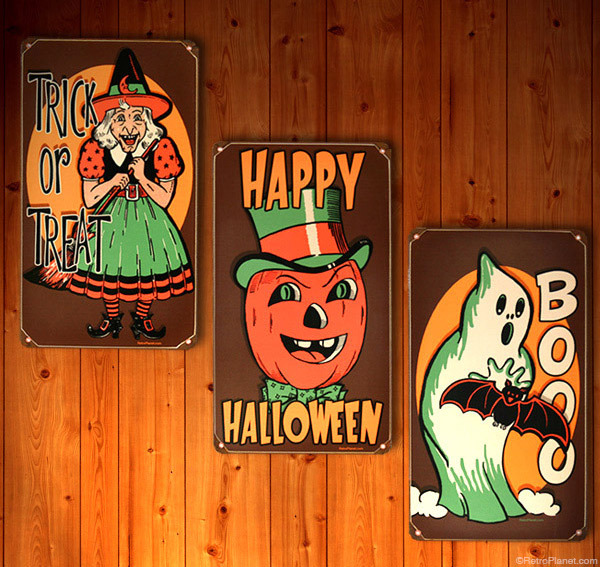 Our metal signs and other retro-inspired products will help you get ready for a night of fright! Totally retro Halloween signs will give you the vintage look you love. These signs are SKU#s 31763, 31764 and 31765. Our heavy-duty metal signs feature reproduction vintage art. All of our signs have pre-drilled holes so hanging them is easy. I like to lean them up against a wall or on a mantle or windowsill and surround them with small pumpkins. Add a dish of candy and a candle and you have a stylish spooky display. Decorating is easy with Halloween themed salt and pepper shakers, a tin tray and the black cats candy dish displayed in your home. SKU#s 39332, 44028 and 44030. Our adorable Halloween inspired salt and pepper shakers can be used on your dining table or as decorative figures throughout the house. If you have a table by the front door you can deck them with store bought spiders and small tealight candles. 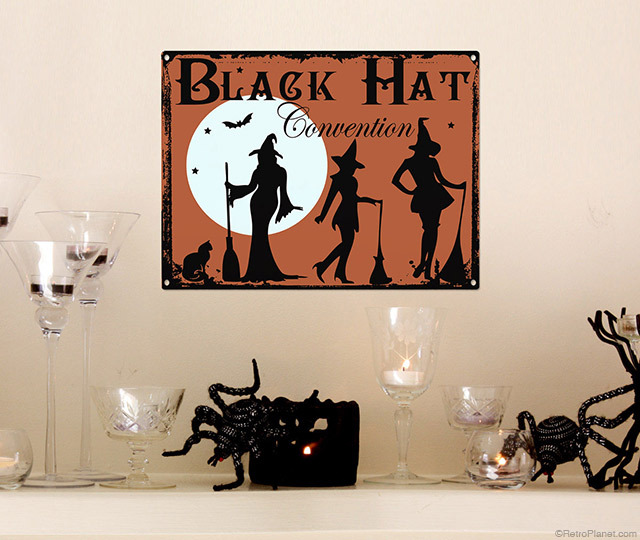 Add one of our spooky Halloween metal signs as the finishing touch. 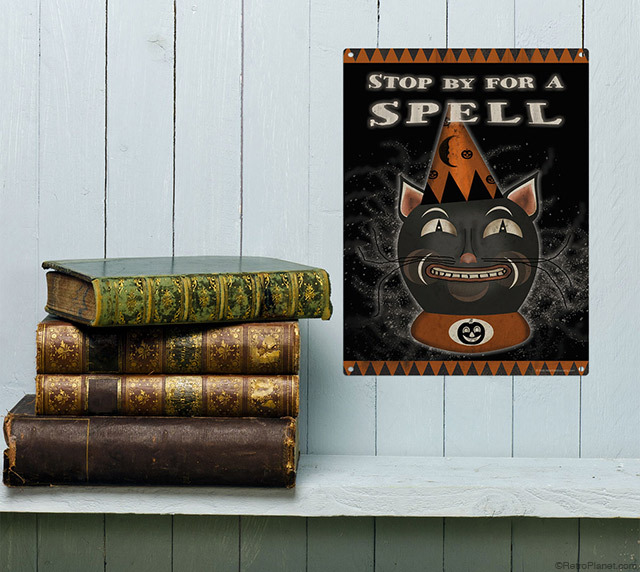 Decorating can be as simple as hanging a sign on your wall, like the Stop By For A Spell Black Cat Sign, and adding a stack of old books beside it for a cool vintage look. The design of this sign was inspired by vintage Halloween decorations and provides a creepy yet fun Halloween vibe. 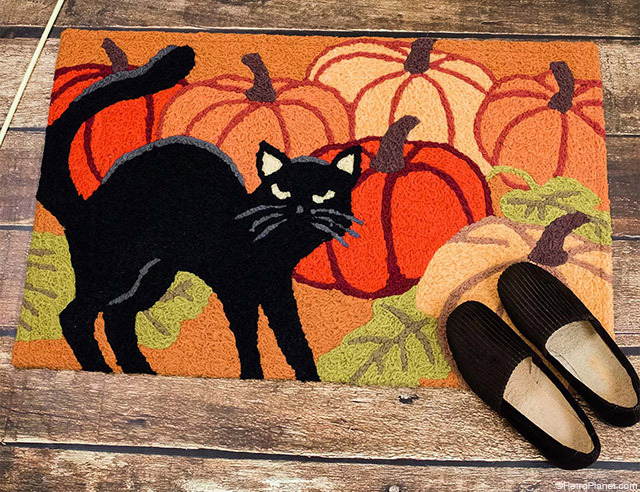 Our Black Cat and Pumpkins Indoor/Outdoor Rug is an easy and fast way to add a seasonal look to your entryway or as an accent in any room. 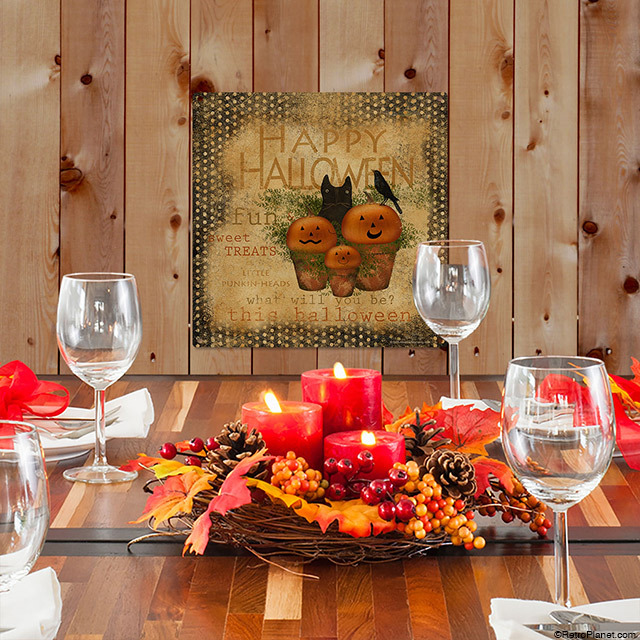 The Happy Halloween Sign makes a stylish Halloween backdrop for your table setting. It has fun seasonal folk art and will add a cozy feel to any space where you’d like less creepy and more warmth. Whatever your Halloween style is, all of us at RetroPlanet.com hope you have a hauntingly good time! Click on the link to see all of our fun Halloween products including Halloween decor, Halloween party accessories and costume items.